One of the most surreal photography that anyone could possibly think of is Baby Portraits Photography. Photographers find themselves smiling at many instances and becoming a child themselves during such shoots. It is indeed true that photographing babies needs a lot of patience and time but nothing can equal their cherubic faces. 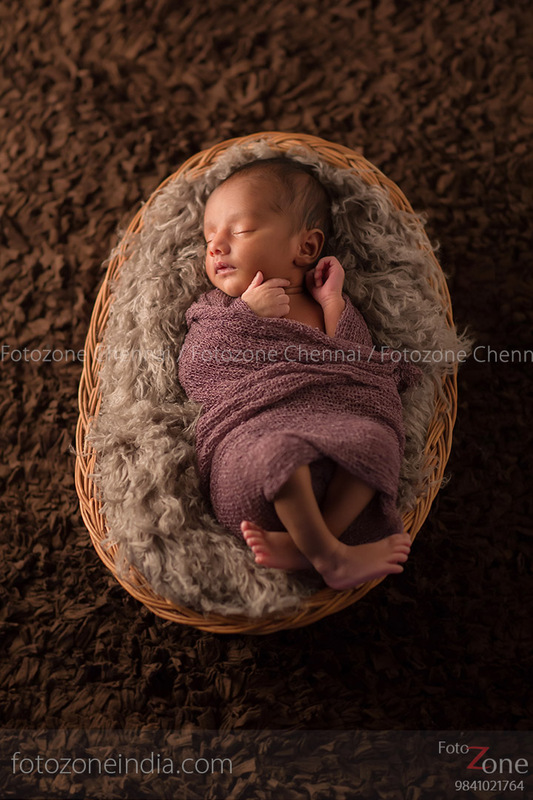 This blog is all about how to excel in photographing babies, considering FotoZone has done innumerable photoshoots of babies and toddlers. Like any other photoshoot, Baby Portraits requires a lot of preparation. Remember that the subject you are shooting has no clue as to why there is so much fuss around her/him and she/ he is in fact given the celebrity status during the entire shoot. Usage of Lights | Try to shoot in natural light as much as possible. Identify spaces and angles that allows natural lights but does not make the subject look flat. If you are shooting in a studio, use the props in a manner that it does not overpower the baby itself. Watch Your Aperture | Wedding photographers love to shoot at f1.2 and 1.4. However for baby portraits, you will have better luck with your depth of field and sharpness by shooting around f2 to f2.2. Go Candid | Be patient and wait for genuine smiles. Try talking and engaging with your subject from behind the lens or sitting down with your camera during playtime. After a while, babies and children – and even adults — will forget the camera and return to whatever they’re doing. You will capture some precious moments that encapsulate the spirit of your child and your family. Go Macro | When the baby is asleep, go for your macro shots! Do close ups of the baby’s toes, little bits of hair on their shoulder, pouty lips, and ears. These shots are not just adorable but could make great album covers.